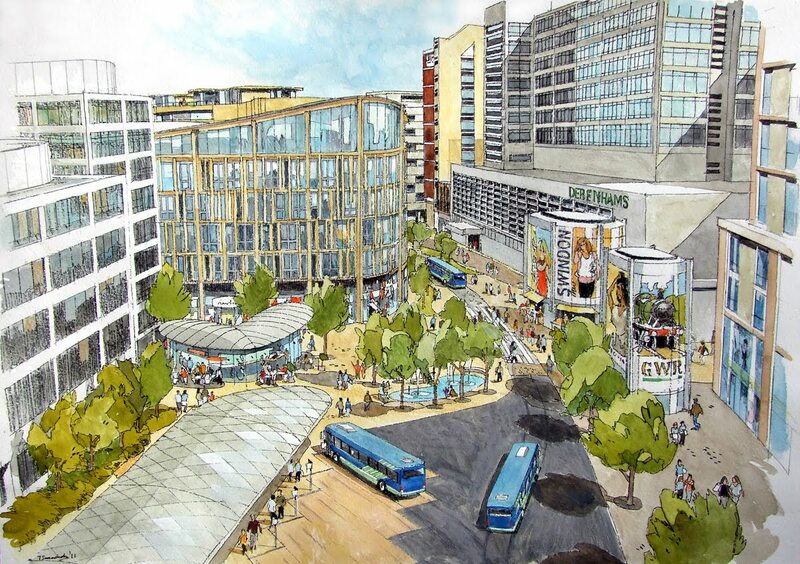 An Artist's impression of Fleming Way after the Union Square development. With a vast increase in the amount of usable public space, The Parade underpass has gone with a wide 'shared space' crossing in it's place. Urban regeneration is not just about what you build, but the space you create. In many ways, the space a building gives outside it's walls is more important than the space it has for use within. The majority of Swindon's streets and it's retail core is strictly stuck in the 1970s pedestrianisation era in regard to it's use of space. Regent Street, Bridge Street and Canal Walk were made into spaces for people to walk safely in whilst shopping than dodging cars, vans and buses. The majority of UK towns and cities have main shopping centres based on this principle, but a policy of gradual improvement stopped for Swindon in the mid nineties and has only recently restarted. Pedestrianisation is the simple principle of allowing people walking to take priority over all other transport methods. But like motor vehicles, routes need to be correctly paved, uncluttered, of the correct capacity and with street furniture and building design that allows a degree of wayfinding. If you take a simple journey from The Parade to the bus station you can witness the historic stagnation of our public realm. The wide space of The Parade outside Debenhams allows people to spread out, but then you are funnelled into the subway beneath Fleming Way, whilst dodging people coming down the slopes from above and the shops either side of the subway entrance. From being in a space that was 40 feet wide, to a low subway, with barely 10 feet of width within just a few steps. Reaching the other side of the subway, the steep approach ramp is not wide enough, the funnelling effect in evidence, with pedestrians dodging those coming the opposite way and from the two slopes and steps from Fleming Way. The wayfinding is not in evidence for the bus station, there's little to intuitively give the feel a bus station is behind one of the Zurich TriCentre buildings. Taking the most direct route, at the back of Carfax Close, the path is narrow and obstructing the view are the pillars of the TriCentre, the route is then squeezed between the TriCentre and the bus station, until the walkway opens out into the narrow space of the bus station which has no waiting space for passengers. No visual warning is given that the bus station is immediately around the corner, the build quality, with no glass, windows or breaks in the dark coloured brick structure gives any cue. As a result of all these pedestrianisation issues, this short journey is aggressive, uncomfortable and unforgiving for the pedestrian. The basic part of this journey, across Fleming Way, will be radically altered with the regrading of the road, putting the entire street on the same level, with pedestrians walking across the road in a far wider space. With the Union Square development, the improvement in the quality of the spaces around new and existing buildings is a main part of the design. Good design can make the pedestrian experience in Swindon so much better. The New Look For Retail... In Swindon?